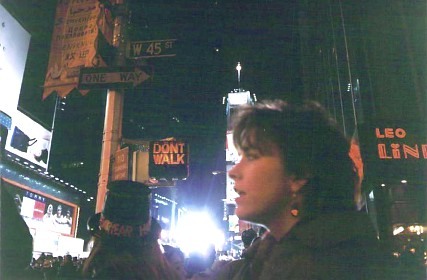 December 31,1994, it’s New Year’s Eve and I am in Times Square waiting for midnight to arrive so Mayor Giuliani can drop the big crystal ball on the city that never sleeps. In 1994 no one ever called me E. I was always very adamant when asked, ” My name is Elizabeth and no, I don’t shorten it thank you very much! ” Well, I was actually more polite than that, but underneath I always thought if I wanted people to call me something else, I would have told them in my introduction. For reasons unknown to me, some people would feel obliged to come up with nicknames for me as if Elizabeth was too much of a mouthful and I was usually okay with that as long it was not a generally recognized nickname for Elizabeth such as Liz, Beth, or Betty. I have always liked my name, but have been willing at times to accept a nickname that was more of a term of endearment and specific to me. As I’ve gotten older, I’ve mellowed a good bit in some parts of my life and what I’m willing to answer to is one of those areas. I am not quite sure when I began to feel as if E was an acceptable nickname, but my friend Patrice has called me E for as long as I as I can remember and at some point in the eight years that I’ve known her, it’s become okay with me for my other friends to call me E as well. Of course if you’d prefer to call me Elizabeth, I’ll always be happy with that. John doesn’t have a nickname for me and I love hearing him say my name with his darling English accent so I’m pleased that he prefers Elizabeth. In the photograph above I am perched at the junction of two barricades that actually say, ” Police Line Do Not Cross.” When I look at this picture from 1994, it makes me think of several things, one being how easily I seem to be balanced on the barricade (I’m not sure I could pull that off now) and two, the message underneath me. I tend to read it as, there’s a line with E (me) that one does not cross … which translates in my mind to boundaries. I can be a bit rigid with some of those boundaries and a barricade of sorts can easily come up if someone pushes too hard or crosses a line with me. For years my name was one of those areas. I was polite but firm in my corrections and pretty much insisted people address me by my proper name. As 50 approaches, I have to admit that I may be beginning to mellow because Gary (the man who owns our village pub) keeps calling me Lizzie and I am really not bovvered by it at all. I choose to see it as a term of endearment and acceptance into my new community. Let me add here, while I prefer Elizabeth to anything else it does make me smile when my friends call me E.
If you are late to the party and have no idea what Day Nine means … you can catch up by going here for a quick read. PS. I just found this photograph from the same night and had to add it to show you a bit more of the city getting ready for the ball to drop. My mouth is hanging open … we’ll say in amazement, but who knows really. Sorry it’s a bit blurry, but it was a pretty big party night.